I am thrilled to be a stop on the book tour for Arrows by Melissa Gorzelanczyk hosted by Rockstar Book Tours! Today, I have an interview for your reading pleasure, but be sure to check out the additional stops below, or click on the tour banner above, for more! People don’t understand love. If they did, they’d get why dance prodigy Karma Clark just can’t say goodbye to her boyfriend, Danny. No matter what he says or does or how he hurts her, she can’t stay angry with him . . . and can’t stop loving him. But there’s a reason why Karma is helpless to break things off: she’s been shot with a love arrow. Aaryn, son of Cupid, was supposed to shoot both Karma andDanny but found out too late that the other arrow in his pack was useless. And with that, Karma’s life changed forever. One pregnancy confirmed. One ballet scholarship lost. And dream after dream tossed to the wind. Welcome to Bookish Lifestyle, Melissa! I'm so excited to have you here with us today! 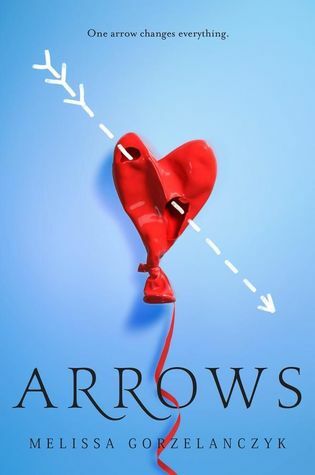 In tweet form (140 characters or less), how would you describe the story of Arrows to those who haven’t heard of it yet? I think the plot started because I loved the idea of “cupids among us” while also being able to explore what love is, and what it’s not. From there, inspiration was layered during multiple revisions and brainstorming sessions. Putting my own spin on the myth of Cupid and Psyche--as well as reflecting on bad relationships I’ve experienced or observed in real life--helped add depth to the story. I’d say the last. A scene doesn’t start to take shape for me until the first line feels right. Teaser: the last line of Arrows is only two words. What characters from mythology are your favorite? Do you have a favorite mythological couple? They’re all a little terrible, aren’t they? That said, of course I love Aaryn, the cupid in my book. I also really really love Psyche—the girl who gave up her human existence for love. That’s so sweet and tragic and gutsy. And she stood up to her crazy mother-in-law. One girl finished my book and said it made her realize the relationship she was in wasn’t healthy. If I could live in any TV/movie/book universe, it would be . . . I’d want to switch between Gossip Girl (hello, Chuck Bass) and Friends (because I’d always be laughing). If I could tell the world just one thing, it'd be . . . Take a chance. I'm addicted to . . . Two things: Coffee, and that feeling I get when I write a line I love.